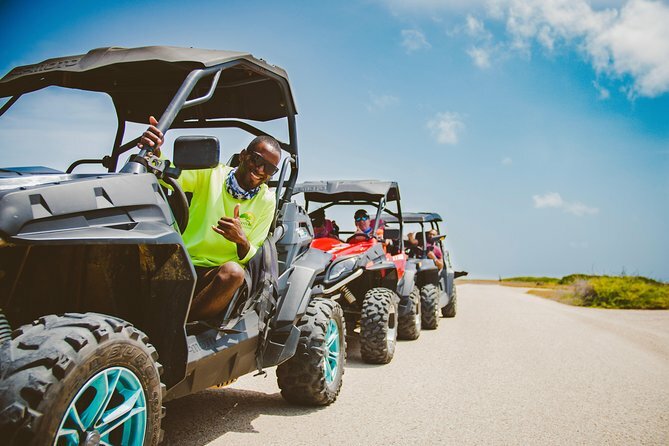 Discover Aruba’s best kept secret places on an off-road UTV adventure led by expert tour guides! 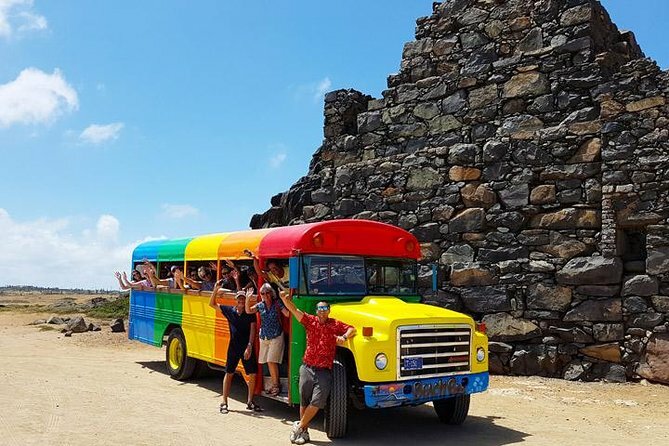 Fofoti Tours and Transfers has created a brand-new thrilling experiential tour that will take you on a wild 7-hour ride all over the island to visit Frenchman’s Pass, the Museum of Industry, the Water Cave, Baby Beach, Guadirikiri Cave, the Bushiribana Gold Mill Ruins and the iconic California Lighthouse. PLEASE NOTE: This is a rigorous tour! Participants need to be in good physical shape because there is hiking and climbing involved! Enjoy a half-day beach adventure in Aruba. Visit both Mangel Halto Beach and Baby Beach and take in the stunning scenery. Go snorkeling or simply sit back, relax and immerse yourself in your gorgeous surroundings. This guided tour includes use of snorkeling equipment and hotel pickup and drop-off. Your charter will be customized to your wishes, from setting the itinerary with the captain. Your wish is our command! The ultimate celebration of your wedding, birthday, bachelor party or corporate event or reserve the boat just for your significant other and you. 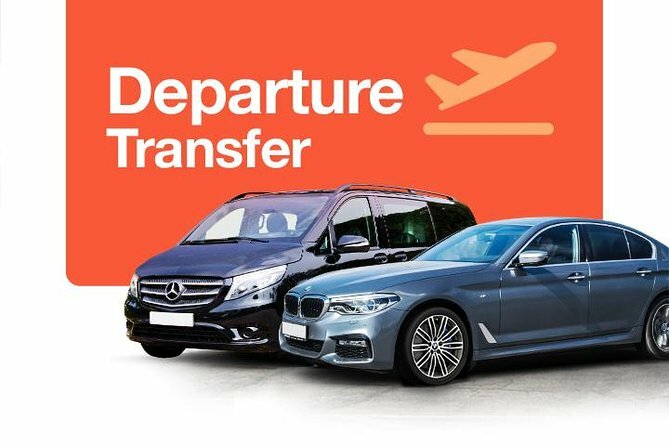 Use a door to door transfer, a comfortable and hassle free service that will allow you to enjoy your journey from the moment you arrive to the beautiful city of Oranjestad. 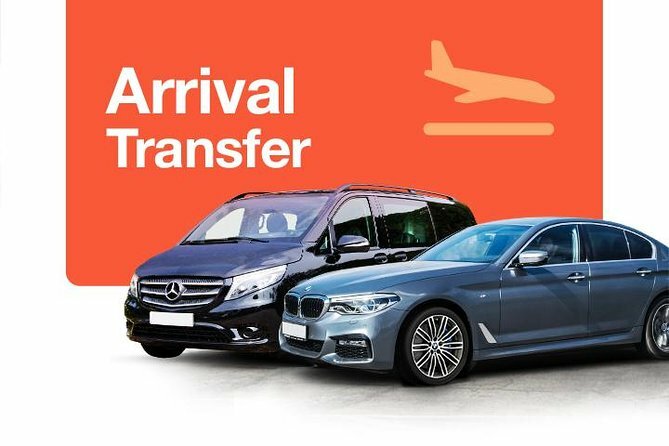 Your driver will be waiting for you in AUA Aruba Airport arrival hall and will take you straight to your centrally located hotel in Oranjestad. Feel the unparalleled freedom of movement and flight. Fly above the ocean and admire the clear sea and white beaches! 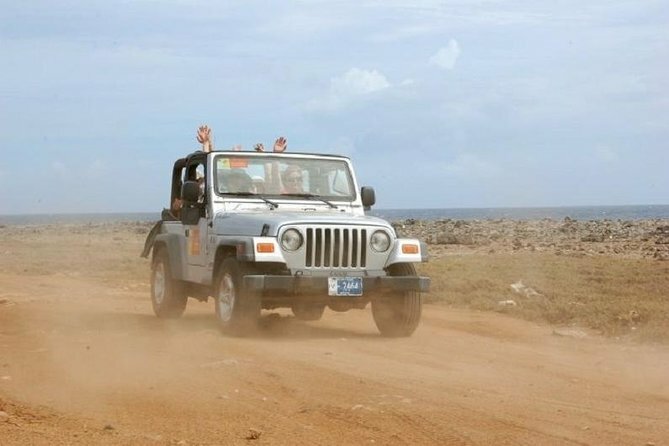 Enjoy a unique off-road tour of Aruba's highlights in a four-wheel drive jeep. The two-door jeep provides access to numerous outstanding locations not accessible by standard vehicles. The jeeps are automatic and hold 4 guests only. If you have less than 4 in your group, your guide will match you up with others. Guests wanting a private jeep will need to purchase all 4 seats. Heading out in your 4X4, you will journey to the California Light House that received distress signals from the Titanic as she went down in icy waters in 1912. After the California Light House you will make a short stop at the Rock Garden. Here you can marvel at this unique garden and admire the views of the rough North Coast. 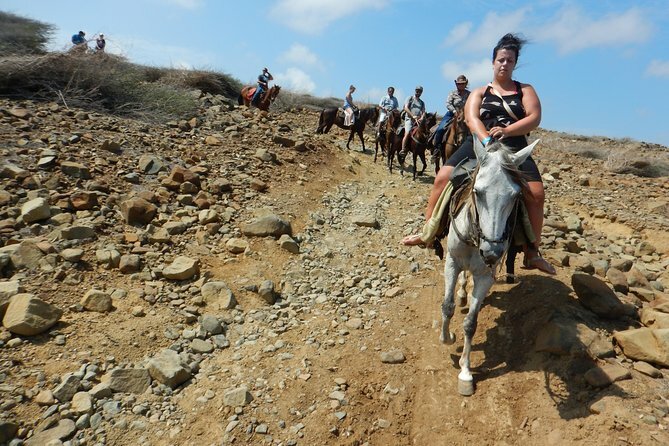 From the ranch you will be taken on a 2-hour guided horseback riding tour through the 'Cunucu' or Aruban countryside with no streets or traffic and venture to where the donkeys, iguanas, parakeets roam free. Enjoy the rough north east coast with the waves crashing wildly onto the rocky shores,walk on a beach if weather permits, into the ocean. 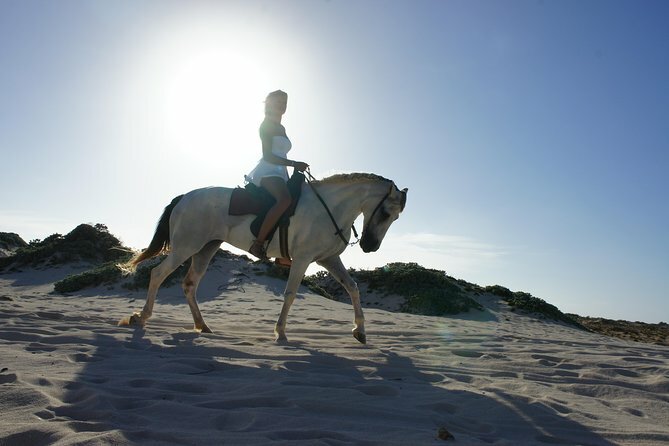 If the guide sees you can control your horse well the dunes of soft white sand are a great place for a controlled gallop,scenic views and photos. This tour is very nice for the more advanced riders. English and western tack available. Galloping is allowed for the experienced riders (tour guides discretion). Free round-trip transportation provided. Choose from one of two departure times when you book. Captain Jethro Gesterkamp and his First Mate Sebastiaan have been initiating delighted visitors to snorkeling and the relaxation of multi-hull sailing for over 25 years. Focused on personalized service and attention, particularly for the novice or inexperienced snorkeler, makes your trip especially attractive. With snorkel instruction, to give you a unique and memorable experience, put on your snorkeling gear and descend under the crystal-clear turquoise waters and immediately find yourself transported into an underwater paradise on this fun and interactive water excursion. Enjoy the underwater world while snorkeling and then tasting the great food that is freshly prepared every day and drinks. The 41 ft trimaran sailboat accommodates 26 people. 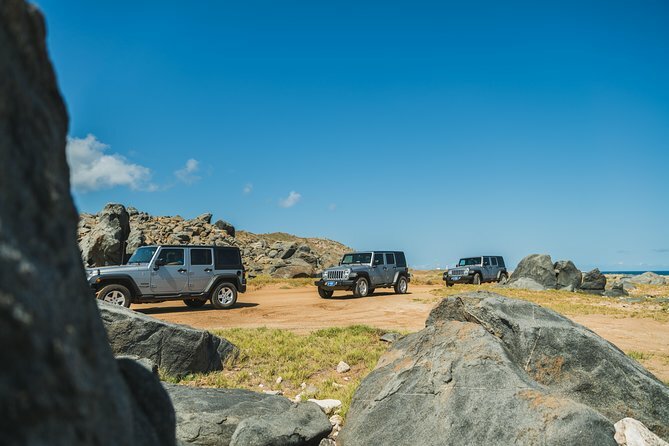 Explore Aruba in your own off-road vehicle — a Jeep Wrangler or Kia Sportage — checking out natural landmarks, parks and other attractions that make up this arid island in the southern Caribbean. See the ruins of the Natural Bridge, Arikok National Park, Boca Mahos and Baby Beach. Then enjoy a waterfront lunch at Pelican Nest Seafood Grill. 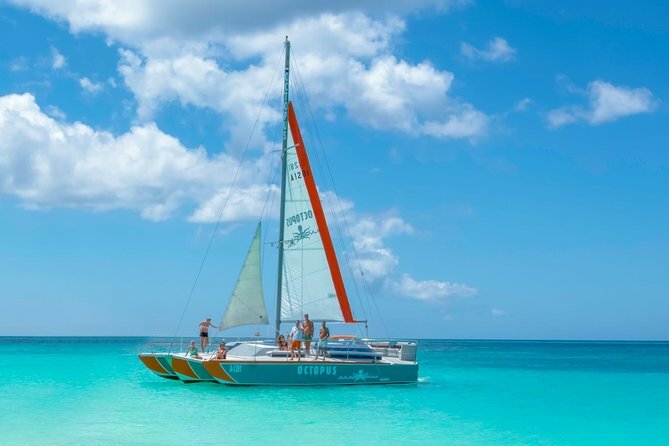 Round out your day of outdoor fun with a catamaran snorkeling cruise (if full-day option selected). Hotel transport is included. 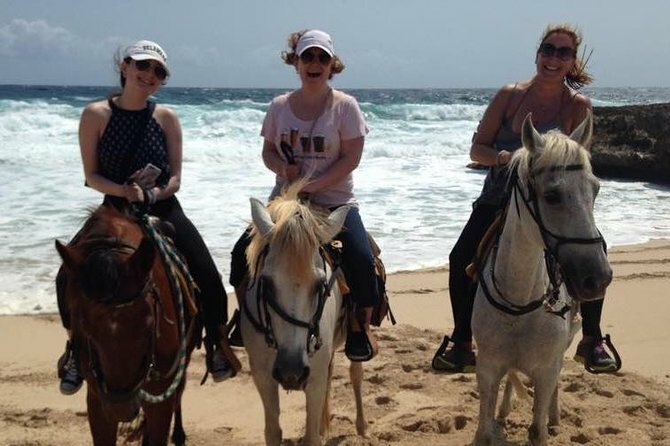 From the ranch you will be taken on a 2-hour guided horseback riding tour through the 'Cunucu' or Aruban countryside with no streets or traffic and venture to where the donkeys, iguanas, parakeets roam free. Enjoy the rough north east coast with the waves crashing wildly onto the rocky shores, pass the wish garden,walk on a beach and if weather permit into the ocean. If the guide sees you can control your horse well the dunes of soft white sand are a great place for a controlled gallop, scenic views and photos. Other trails might be chosen. There are many different trails. Depending your skill level and preferences. This tour is very nice for the more advanced riders. English and western tack available. Galloping is allowed for the experienced riders (tour guides discretion). Free round-trip transportation provided. Choose from one of two departure times when you book. 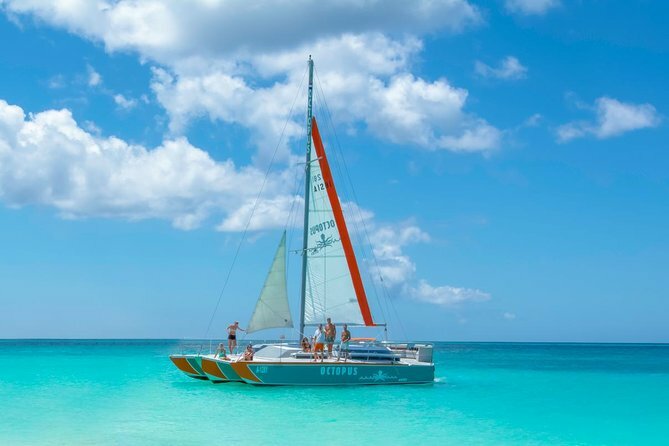 Experience a wonderful afternoon sailing on the Aruba blue sea and admire the stunning sunset from a 41 ft trimaran sailboat. Board in a fun and relaxing 2-hour tour passing the northern island coastline, accompanied by music and an open cocktail bar. 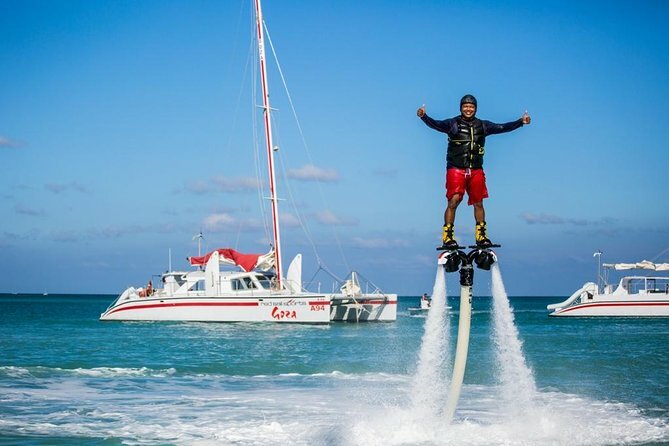 The Captain and his crew will be pleased to make your moments even more memorable. During the journey, food and drinks will be served. From the ranch you will be taken on a 2-hour guided horseback riding tour through the 'Cunucu' or Aruban countryside with no streets or traffic to where the donkeys, iguanas, parakeets and more live Sometimes we see them.A unique countryside trail that leads to the chapel with beuatiful sites .Enjoy country quietness. Stop at the famous and oldest Alto Vista Chapel (1750) for scenic views and photos. Enjoy the ride along the North coast where the waves crash wildley onto the rocky shores. The terrain is easy to ride.This tour is perfect for beginners and all skill levels are welcome! Galloping is allowed for the experienced riders when possible. (depends on the group) Free round-trip transportation. 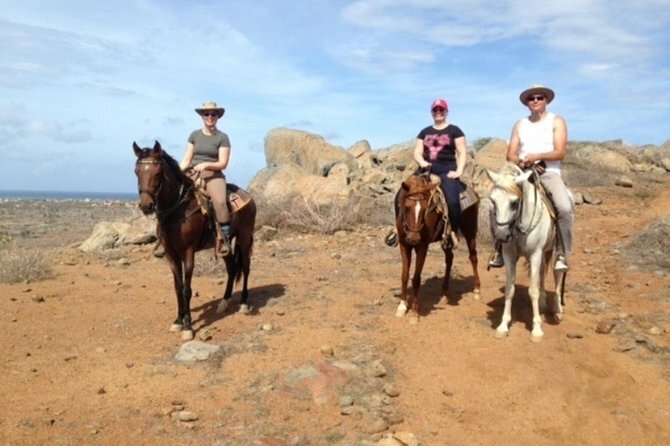 Enjoy a 3hour private tour of the highlights of Aruba. 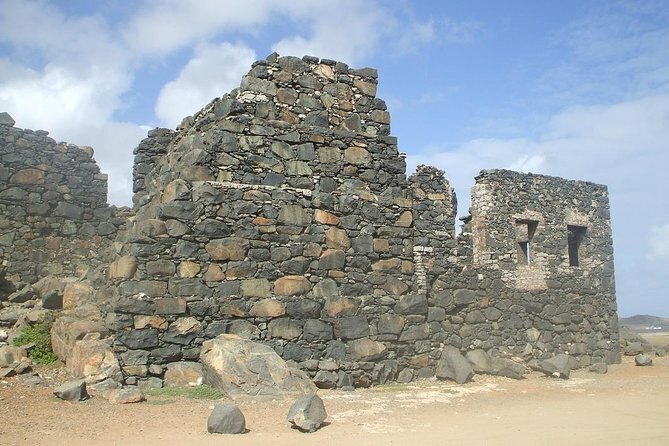 This tour is meant for up to six people and is one of the best ways to get an up close and personal with Aruba. Get to know the extraordinary Casibari Rock formation and the see the Arawak Indian Drawings. 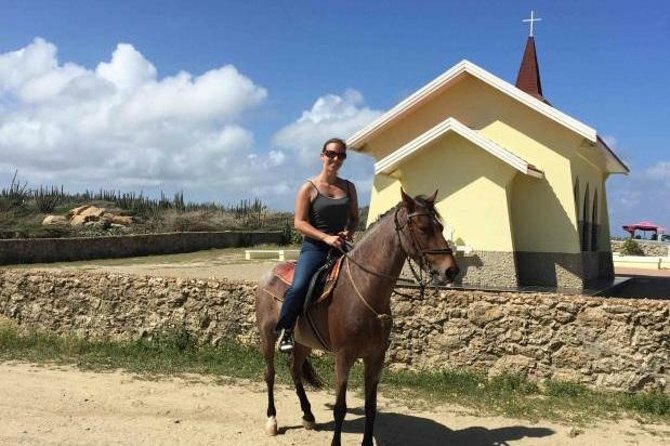 From the ranch you will be taken on a 1.5-hour guided horseback riding tour through the 'Cunucu' or Aruban countryside free of streets and traffic. You guide will take you through where the donkeys, iguanas, parakeets and other animals live until you reach the small secluded Urirama Beach or as the locals call it a "boca" (cove) at the North East coast of the Island.It is a very pretty ride. Enjoy typical Aruban views . This rides is perfect for beginners and children - all skill levels are welcome! Galloping is not allowed! Free round trip transportation is included. 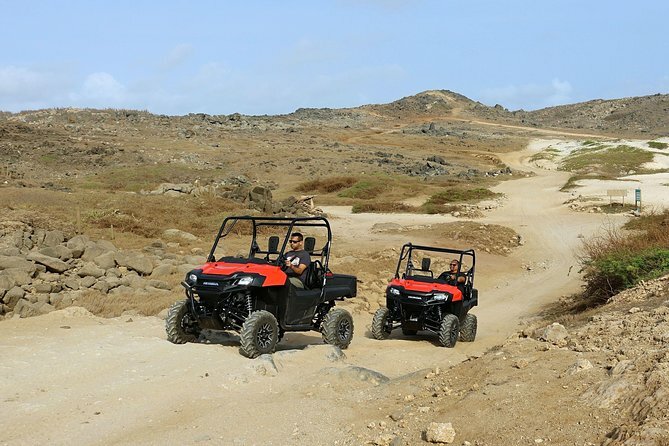 Enjoy gorgeous vistas of Aruba’s rugged terrain, desert-like hills filled with tall cacti, a breathtaking coastline and protected local flora and fauna. "Rock" our expert tour guide will take you on a memorable journey of the islands past offering unique geological, cultural, stories and as you walk, you'll learn the history of Aruba One Happy Island ancient roots. 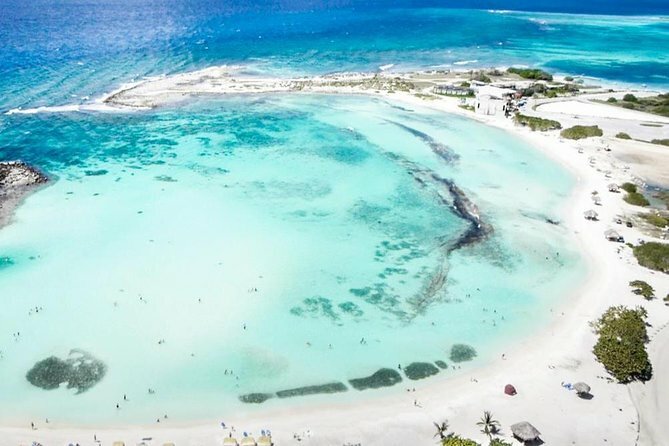 You are warmly invited to the National Park and beaches, enjoy Aruba’s natural beauty at its best. 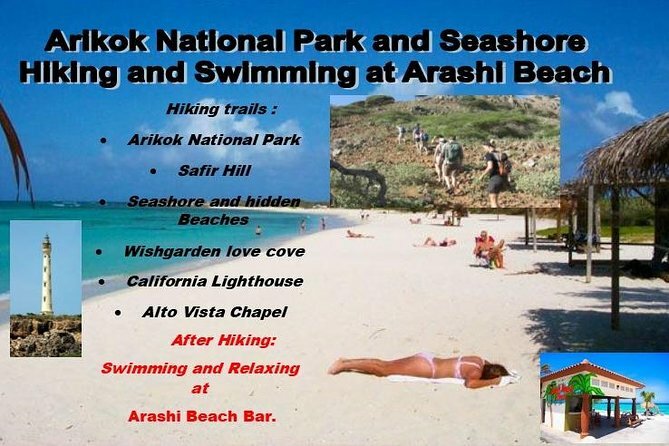 Visited Tourist Attractions : Arikok National Park, Safir Hill, Hidden Beaches, Wishgarden love cove, Alto Vista Chapel, California Lighthouse and after hiking relax and swim at Aruba most visited beach 'Arashi Beach' Bar.